Tonight knitters across the globe will be casting on their Ravelympic projects during the Opening Ceremonies of the 2010 Winter Olympics at 6pm Vancouver time. Here on Clear Creek I’m gearing up for some extreme knitting. In the sixteen days while athletes are testing their speed, endurance and artistic abilities I’ll be putting myself in extreme knitting mode as well. Of course, if you know me you’d be apt to guess the extreme part will be my staying monogamous to one knitting project for a full sixteen days. 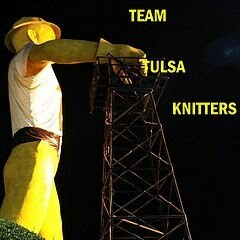 I’ll be one of numerous participants competing on Team Tulsa Knitters. There are others on the team and I’ll gather their blogs to share here later today as time permits. This is the nifty badge one of our athletes designed. What? You thought you were well aware of all the components in play? Presenting a new yarn – Tandem a fabulous team of 50% wool and 50% silk in Avalon, a coloway inspired by mists, mythical lakes, goddesses and the fairy folk. Remember knitting burns approximately 100 calories per hour. So really it counts as exercise. What are you knitting for Ravelympics? 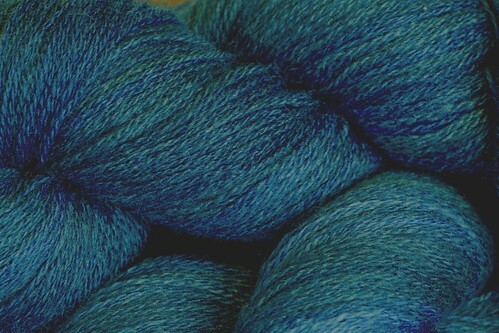 PreviousPrevious post:New Yarn!NextNext post:Kate Scores!